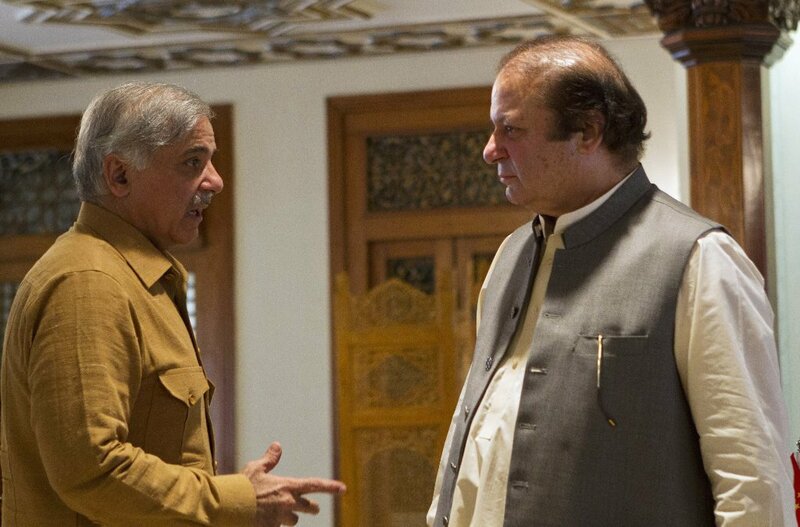 ISLAMABAD: Pakistan Muslim League-Nawaz (PML-N) supremo Nawaz Sharif and his younger brother, PML-N President Shehbaz Sharif on Wednesday discussed matters related to the party in wake of the recent actions taken by the national accountability watchdog against the opposition leadership. During the meeting held at the Ministers Enclave in the federal capital, the two men discussed the situation arising out of the recent arrests of former railways minister Khawaja Saad Rafique and his brother Salman Rafique in the Paragon Housing Society scam. They also discussed the placement of Punjab Assembly Opposition Leader Hamza Shehbaz’s name on the Exit Control List (ECL) and cases and investigations launched by NAB against other PML-N leaders. NAB arrested Saad and Salman Rafique after their pre-arrest bail applications were rejected by the Lahore High Court (LHC) on Tuesday. The brothers had filed a petition in the Islamabad High Court (IHC) when NAB summoned them to appear before its combined investigation team (CIT) in connection with a probe into the Paragon Housing Society. The IHC on October 11 asked them to approach the LHC, which had later granted them pre-arrest protective bails. The pre-arrest protective bail was extended earlier but on Tuesday a two-judge LHC bench denied an extension after hearing arguments of both the sides. Afterwards, a NAB team arrested Rafique brothers, who had appeared before the bench, from the court premises. Pakistan Muslim League Nawaz (PML-N) activists present in the court premises agitated against the move; staged a protest and chanted slogans against the arrest. Meanwhile on Monday night, immigration officials barred Hamza Shehbaz from boarding a flight to London from Lahore stating that NAB had placed his name on the ECL in connection with the Ramzan Sugar Mills probe. NAB has also begun an investigation against PML-N spokesperson Marriyum Aurangzeb for owning assets beyond her known sources of income.